Cucamelons are small fruits that are about the size of a large grape and look similar to a watermelon. When cucamelon fruits are ripe, you can eat them whole with the skin and enjoy their slightly sour taste. People say cucamelons taste like a sour cucumber with a dash of lime. People enjoy consuming these small tart fruits because it is claimed they are very healthy for you. Little research has been done into the health benefits of the cucamelon plant. However, cucamelon fruits are said to contain antioxidants, vitamins, and other nutrients. In this article, you will learn more about this delicious fruit that looks like a miniature watermelon. You will also find out how to grow your own cucamelon plant to enjoy its many health benefits. Cucamelon has become a popular fruit and many people say that it is a superfood. 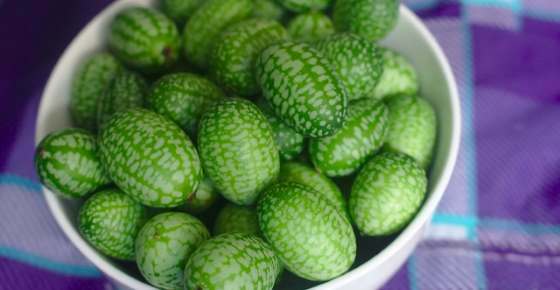 Cucamelons are also called “mouse melons”, the “Mexican sour gherkin”, and the “Mexican sour cucumber”. In Spanish cucamelons are called sandiita, or, little watermelon. You may also hear cucamelons referred to as pepquinos, or the Mexican miniature watermelon. Cucamelons are native to Mexico and Central America. Although most people have generally only heard about these mini-melons in the last few years, cucamelons have grown in Mexico for centuries. The good news is that you don’t have to travel to Mexico to buy cucamelon fruits. You can grow your own cucamelons if you live in a warm climate. You can buy cucamelon seeds and plant them similar to cucumbers. Cucamelons grow on a thin vine and you know when the fruits are ripe because they drop off the plant. There are many claimed health benefits of eating cucamelon fruits. Each small fruit from the cucamelon plant may pack a punch when it comes to its nutritional value. Cucamelons are rich in vitamins, minerals, and the tough skin is a good source of fiber. Some people claim that this superfruit is good for your heart, protects against aging, lowers your risk of stroke and has anticancer properties. It is also easy to prepare cucamelons to enjoy their many health benefits. You can chop up raw cucamelon fruits and add to salads. Or, you may prefer making cucamelon pickles to enjoy the small green mini-melons later. Although cucamelons are in the same family as cucumbers, they are much easier to grow. The small fruits of the cucamelon plant are also fascinating to look at because they look like miniature watermelons. It is rare to find cucamelon fruits in local health stores. If you want to enjoy the taste and health benefits of cucamelons, you will probably have to grow them yourself. Here are step-by-step instructions to grow this perennial exotic plant. Where to buy cucamelon seeds? First, you will need to buy cucamelon seeds. You can easily find seeds to grow a cucamelon plant at online stores such as Amazon (like this one). To make sure that your cucamelon seeds germinate and grow, it’s important to purchase high-quality seeds. So, check out online reviews of the individual seller. The best cucamelon seeds should be organic or free from chemicals. The good thing about growing your own cucamelons in your garden is that you can save the seeds from the ripe fruits. This will allow you to plant more cucamelon plants next year. Even though cucamelon is a perennial plant, you may have to dig up, store, and replant the tuber every year. The tuber is the thick root part of the cucamelon plant that looks like a potato. Growing cucamelons from the tuber usually results in a better crop of ripe tasty cucamelons. The best time to plant your cucamelon seeds is around April or May (Northern Hemisphere). The soil temperature should be between 75°F and 85°F (24°C to 30°C). Most find the greatest success growing their own cucamelons by starting them indoors in pots before moving them outside. It is important to avoid frost as this will damage the growing cucamelon vine. To ensure that you get a good crop of cucamelon fruits, you should plant them in the right type of soil. Similar to growing cucumbers, cucamelons enjoy fast-draining soil that is rich in nutrients. For this, work compost into your soil to give enough nutrition for your cucamelon plants to grow all summer. The cucamelon seeds can take a few weeks to germinate, so you need to be patient. However, after about 3 or 4 weeks you should see some cucamelon seedlings spouting. You will need to water your cucamelon plant regularly to help it grow properly. Another way to grow Mexican sour gherkins is to put one seed in each pot and grow the plants in a greenhouse. To ensure a healthy crop, you should plant your cucamelon plants where they get plenty of sun. It is important to keep them out of any shade as the “mouse melon” plant needs 6 hours of sunlight every day to thrive. Many people enjoy success growing cucamelon plants when they use a wire cage or trellis to support the vine. You can use a small tomato cage or trellis to help keep the stems and mini-melons off the ground. Cucamelon vines can grow quite large, so buy a trellis that is bigger than you think you may need. You can help your miniature Mexican watermelons grow well by providing enough moisture. During the summer months, water your plants well once a week. However, if the summer is very hot, then you may need to water the sprawling vines twice a week. It is important to monitor the soil for moisture content. If the weather cools, only water the cucamelon plants if the soil dries out. You should check the top 1-inch of soil for dryness. Another way to help your cucamelon plant grow and provide healthy fruit is to put mulch around the base of the plant. Mulch helps control moisture levels and prevents weeds from affecting your plant growth. The thin vines of Mexican miniature watermelons will grow in all directions and cling to almost anything. To ensure healthy growth, you should gently wrap the vines through the trellis. One of the great things about growing your own cucamelons is that they are very durable. Usually, pests don’t bother the vines and birds generally stay away from them. Disease usually isn’t a problem with cucamelons and they should grow fine without having to use any pesticides on them. When is a cucamelon ripe and ready to eat? Before the grape-sized fruits appear on the cucamelon vines, you will notice that flowers appear. From the time you see the flowers, you will have to wait for 2 or 3 weeks before the fruits are ripe to pick. You can harvest any size of cucamelon fruit; however, the larger fruits tend to become firmer with age and have more seeds. The best way to tell if a cucamelon is ripe is by squeezing it to see how soft it is. These miniature watermelons are usually ready to pick around the start of July. If you carefully remove the ripened fruit, the vine will continue to produce fruit until about the middle of November. During the growing season, you can help keep your “melon cucumber” plant healthy by cutting back some of the foliage. Removing leaves from the vine will help sunlight to get through. If you notice any leaves that turn yellow or are dead, cut these off as well. At the end of the harvest in the fall, you should cut back on the dead foliage. To help protect the tuber from frost, you need to dig it out. You can do this by using a garden fork to carefully remove the tuber from the ground without damaging it. To overwinter cucamelon tubers, you can store them in a large pot filled with potting soil. You should place the tubers in layers in the pot so that they avoid touching each other. You can store the pot in a frost-free place throughout the winter ready for planting again in April. What is the Best Way to Eat a Cucamelon? Cucamelon fruits are good to eat straight off the vine. You can cut them off with a pair of sharp scissors and enjoy the sour taste of these Mexican cucumbers. You can also make a simple cucamelon salad by chopping up some of the fruits and mixing them with sliced olives and peppers. Drizzle some extra virgin olive oil and season to taste. Another way to benefit from the nutrients in cucamelons is to use them in fresh salads in place of cucumbers. This will help to give any summer salad a tangy taste from these unique fruits. Why not make your own cucamelon salsa by replacing tomatoes with chopped cucamelon fruits? Just add a bunch of chopped cilantro, some chili flakes, and sprinkle over some crumbled feta cheese. Because cucamelons are similar to cucumbers, they are perfect for pickling. This is one of the reasons why mouse melons are also called Mexican sour gherkins. Here is how you can pickle your cucamelons to enjoy them all year round. A large sterilized jar that you plan to use for storing your pickles. In a pan, bring the apple cider vinegar and water to the boil and add the salt. Allow to cool. Put the prepared cucamelons and other ingredients in your sterilized pickling jar and pour over the cooled vinegar mixture. There should be enough liquid to completely cover the cucamelons. If you need more liquid, repeat step 1 with the quantity of vinegar and water you require. Close the jar lid tightly and let stand for 4 or 5 days. Your delicious cucamelon pickles are now ready for consuming. You can also experiment with the ingredients to create different flavored pickled cucamelons. For example, you could try using just apple cider vinegar (about 1 ½ cups) and 4 tablespoons of raw sugar to create a sweet and sour type of cucamelon pickle.